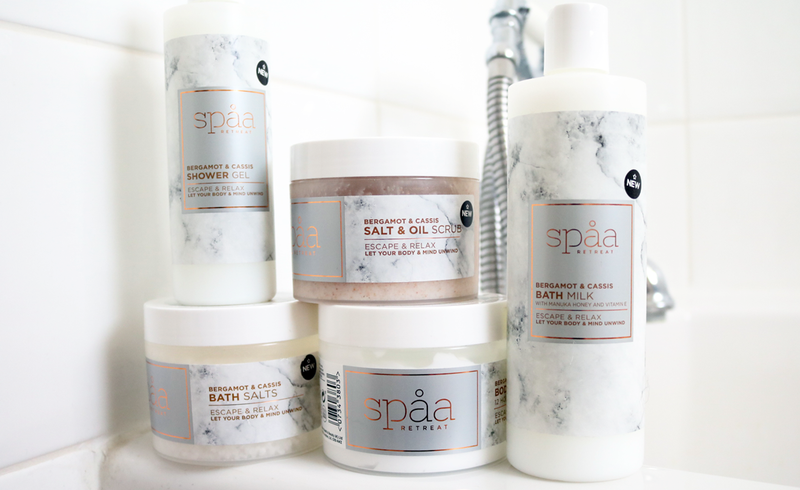 For budget-friendly pampering treats, you can't beat popping into your local Superdrug and picking up a few new products from their own-brand Spaa Retreat range. I regularly shop at Superdrug and have become happily aquatinted with many of their own-brand products and ranges over the years, all of which are certified cruelty-free, and most are now suitable for vegans to use too. 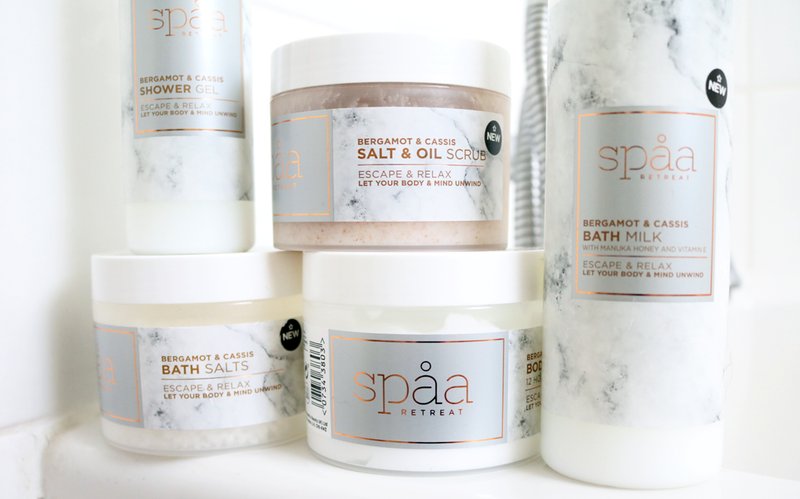 Superdrug have lots of hidden beauty gems within these ranges, and I was thrilled to see them add some brand new products recently to their affordable pampering line called Spaa Retreat. The range has a gorgeous Bergamot & Cassis scent throughout (very clean and fresh with a hint of floral), and the marble print packaging is beautifully on trend, making the products look far more expensive than they actually are. Being a self-confessed pampering addict, I couldn't wait to try some of the new products for myself, so once they arrived I jumped straight into the bathroom! Although this shower gel has SLS in it, my sensitive skin hasn't experienced any problems with it yet, and I absolutely love the Bergamot & Cassis scent which is really addictive and uplifting. It feels far more luxurious than your average budget shower gel and leaves my skin feeling soft and cleansed afterwards. I find it hard to find good quality bath salts on the high street and tend to automatically favour more higher end brands as a result, but I have to admit that these have really won me over. They're made from just six ingredients and are composed mainly of Sea Salt that's been blended with Marula Oil and the signature Bergamot & Cassis fragrance. To use, I just drop two handfuls into a warm bath and then enjoy a long relaxing soak with them. Bliss! Since I've been loving the Westlab Salt Body Scrub & Bath Soak so much lately, I was keen to see if there were any more budget-friendly options available, and this one is the closest that I've found so far. Formulated with a range of nourishing ingredients such as Glycerin, Shea Butter, Sweet Almond Oil, Grape Seed Oil and Vitamin E, this scrub gets to work using a combination of Sea Salt, Sugar and Walnut Shell powder, to gently but effectively, polish away dull dead skin cells, leaving the whole body feeling silky smooth and soft. With Winter on the way, I've been digging out my thicker body butters to appease my dry skin, so I was looking forward to trying out this Body Souffle. Sadly, I've been left a little disappointed by it. Although the texture is nice and it smells gorgeous (again it has the same Bergamot & Cassis scent as the rest of the range), it just doesn't hydrate my skin as much as I want it to. Perhaps one to try if your skin is less dry than mine. The Bath Milk was also a bit disappointing. It's certainly not bad, but it's as not as hydrating as I hoped it would be and I still needed to apply a lot of body lotion afterwards. Again, you may get on better with this if you have normal skin as opposed to dry skin. A few hits and misses, but I'd definitely recommend the Bath Salts and the Salt & Oil Scrub! Spaa Retreat is exclusive to Superdrug - prices start from just £2.99. Have you tried anything from Spaa Retreat?